VENARI-85 is a new mine countermeasure (MCM) concept design capable of clearing mines faster over a greater area and with less risk to the crew, whilst simultaneously providing broader utility to navies around the world. It can perform a spectrum of roles and evolve as technology advances in the unmanned and offboard systems markets. Combining BMT’s ship design pedigree with QinetiQ’s integration expertise, and drawing upon the experience of mine warfare operators from several different navies and system suppliers, VENARI-85 has been specifically designed and configured to exploit the next generation of offboard vehicles, mission systems and operational concepts. 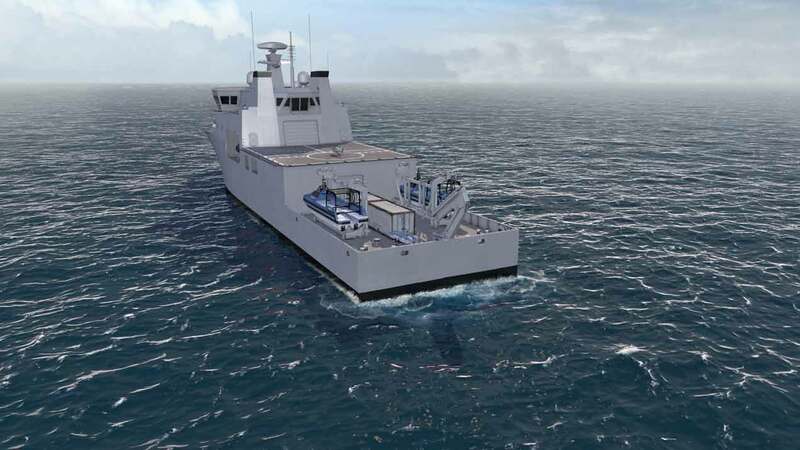 As traditional minehunter vessels come to the end of their life, navies (Belgian, Dutch, UK, French, Norwegian) are looking to replace them with future stand-off MCM capabilities involving a hybrid of manned and unmanned systems. “VENARI-85 represents a huge step change in the way MCM ship design is approached and developed,” says Stephen Braham, head of business development (warships) at BMT Defence Services comments: “Designing platforms with roles and future technology developments in mind seems the logical step but not one that’s often taken. Derived from the Latin meaning, ‘to hunt or chase’, the VENARI®-85 design is optimised for next-generation warfare and hydrographic technology and can operate large numbers of air, surface and sub-surface unmanned vehicles. BMT says this flexibility in design provides a clear development path to enable future generations of unmanned technology and operating concepts to be hosted from VENARI-85 as they mature and develop over the coming decades. Alongside the primary MCM role, VENARI-85 will also be able to perform roles such as maritime security boarding, economic zone protection and contribution to humanitarian assistance and disaster relief operations—all of which reinforce the platform’s value for money credentials.